Yeast bread from scratch is hard, right? Intimidating? Too much trouble? Not in my opinion – nope. Remember my pie-crust-from-heaven Grandma? Well she also made all of her own bread for years. And so did my Mom. 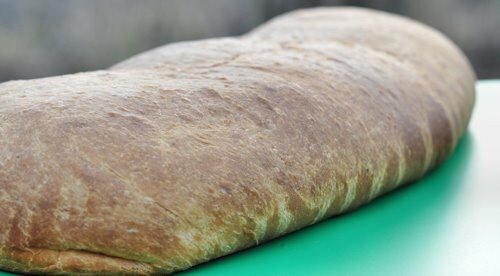 I loved my Mom’s homemade bread but I didn’t like taking it to school in my lunch – it looked weird next to the other kid’s Wonderbread sandwiches. Too healthy. Just a little piece of trivia for ya. 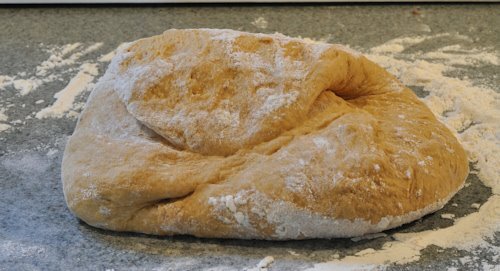 Anyway – if I didn’t learn how to make good pie crusts, I at least learned how to make good bread. In fact for quite a few years I made all of our bread. We were hippies, remember? Hippies always made their own bread. And tofu. And wine – from apple cider we made from wild apples. The bread was really good. The tofu was so-so. The wine smelled like airplane glue. But hippies don’t throw stuff away, so we girded our loins and drank it anyway. Here also, is a little hint from our hippie days. Do not store winter squash and pumpkins in the empty bedroom over the kitchen. The one with the cold air return that goes down to the kitchen where you are hanging out with all of your other hippie friends on the evening when those squash and pumpkins finally succumb to the the inevitable effects of being stored where it is too warm for them. We weren’t detail people, ok? We were on the other hand, alerted when the inevitable happened – the cold air return made sure of that. That little adventure is not entirely unrelated to this recipe since it was about squash and so is this recipe. I try to maintain some sense of cohesiveness in my posts after all. 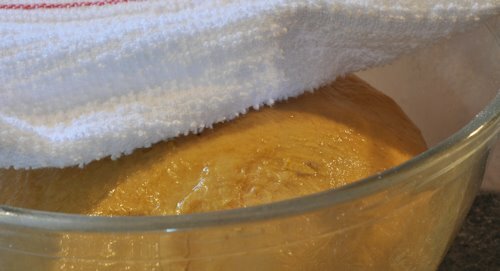 I wanted to use up some of the 90 gazillion pounds of squash I have laying around here this fall and I knew you could use a variety of liquids to make bread, so why not squash? Well – let me tell you; this is an inspired idea that far exceeds the apple cider wine. And making bread is not hard at all – I promise that this will be just the first of my bread making lessons. The line up of ingredients – see? Ridiculously easy. 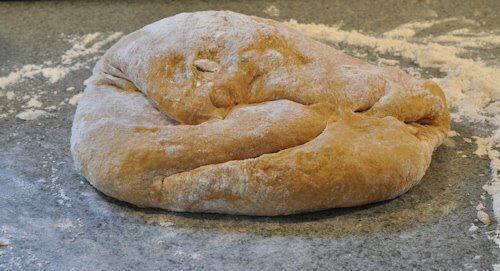 In 90 minutes or so – the dough should look like this – risen and light. 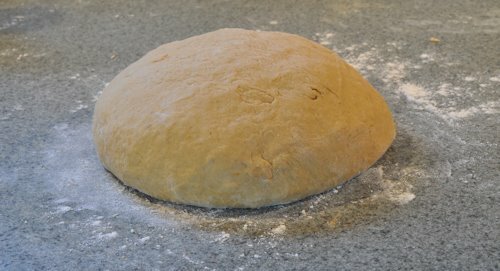 Dump it out on the counter and briefly repeat the kneading sequence for a few minutes until it is a nice smooth ball again. 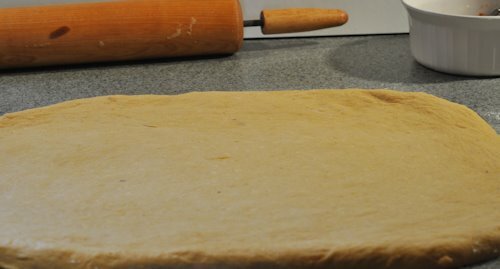 Roll it out until it is flat and uniform in thickness. 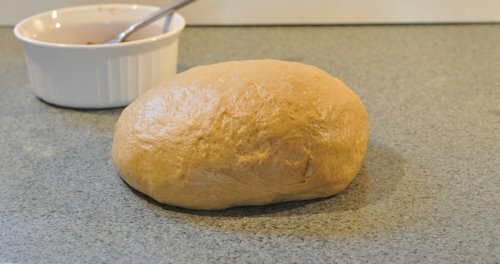 I realized awhile ago that this was going to be too much bread for one bread pan but not really enough for two, so I decided to go for a rustic, freeform loaf that I will bake on a baking sheet. 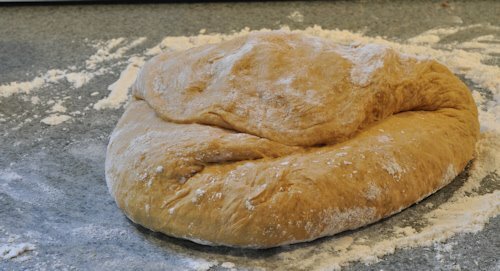 I rolled out the dough to about 12 inches by 18 inches. 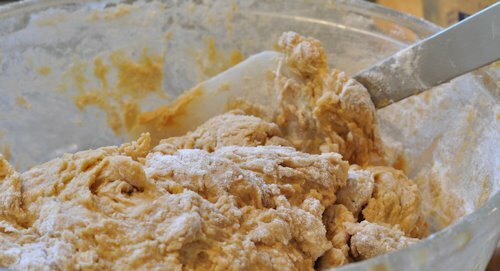 Scatter the cinnamon -sugar mixture over the dough. I was guessing when I made this and ended up with a little too much – I adjusted the amounts listed above down a bit, so it will look like a little less filling than this. Roll up the long way and pinch the edges together to seal them. Tuck in each end by about 3 inches and pinch those edges together – underneath and along the sides and then pat it out nice and smooth again. Place on the baking sheet which is either very well greased or covered with a sheet of parchment paper. 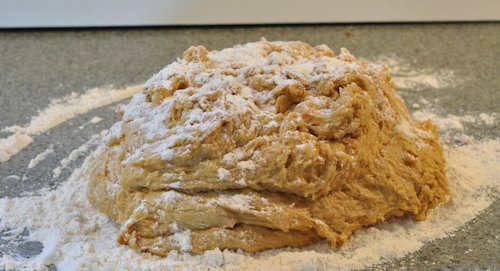 Brush the entire top of the poaf with melted butter and place in a warm place to rise again – until it is just about doubled in size. Bake at 350 degrees for about an hour – until it sounds hollow when you thump it and it is very well browned over the top and sides. Brush once again with melted butter and set on a rack to cool. This is rustic and free form. And it had a little too much filling which caused it to spread out a bit more than I would have liked. I will learn to live with it though – for a couple days anyway. 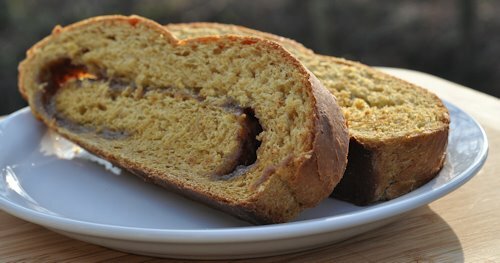 It is so delicious – the squash gives it a richness and depth of flavor that regular cinnamon bread doesn’t have. It is irresistable. 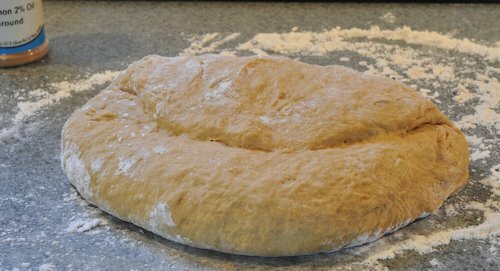 I will do another bread recipe soon – one that will show you that making bread is all about the proportions of the ingredients and how easy it is too make bread using what you have on hand. Let me know if you give this recipe a try – I hope you like it! 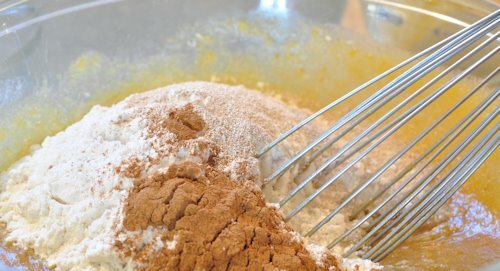 I am so not sure that you could have too much cinnamon sugar in that … gads it looks YUMMMMMY I have no left over squash but I used to make all of our bread too… I LOVE the smell of baking bread…and real butter to put on it when its still warm… OHHHH DROOL! Oh that looks awesome…I think I’m going to have to do it..yep. I have to. I bet Dad was a happy camper. Your bread looks so hearty and tasty, it rose beautifully! 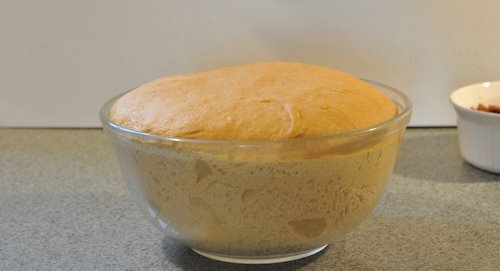 I can never get my yeast breads to rise that well. Great way to use up the squash :). I’d love to include your recipe on our blog, please let me know if you’re interested!